Facebook touts itself as a “social utility that connects you to the people around you.” The service is based on friendship and networking. Finding friends and making new acquaintances is easy. Find Friends gives you the option to import names from your email contacts, search by school and workplace, or browse by name. When you send a friend request that person has the opportunity to review your request. He or she can accept, deny, or ignore your request. New friends can recommend additional friends to each other, add names to lists (to distinguish between friends and family, for example), or send messages to each other. Friends on social media are increasingly becoming people’s trusted sources of information, even more than search engines. News has become more social than ever. How we start and conduct business has changed. How we meet and stay in touch with people is affected by social media. Facebook is an outlet for personal expression. Facebook changes what we can influence. Go to Facebook.com. Follow the prompts to get started. To create your profile you’ll want to add your picture, bio, basic info, interests, your school/work details, plus your favorite books and movies. A Profile is a collection of information that a Facebook user chooses to share with others. 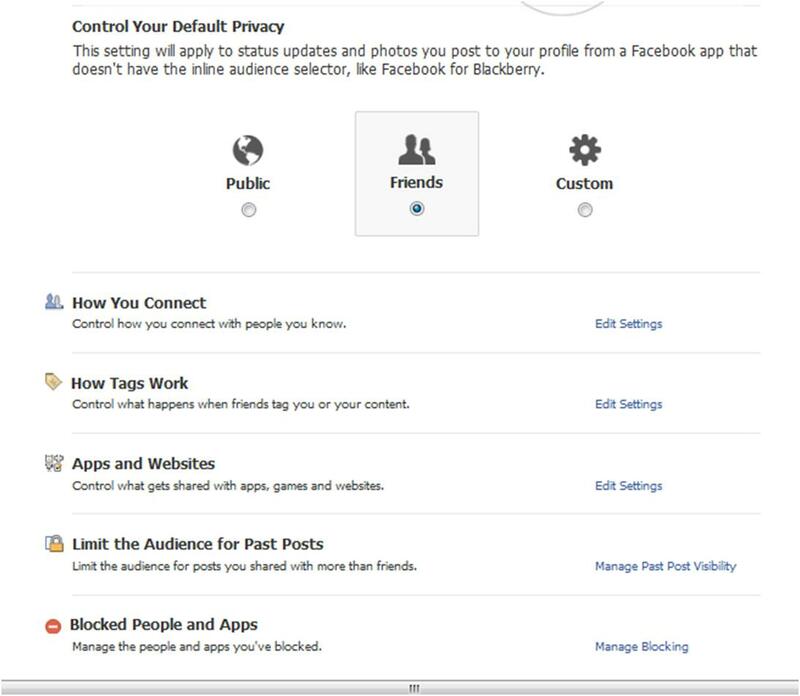 Users can select privacy settings for their profiles and control what information is available to whom. A new profile in Facebook is a blank-slate. You have the opportunity to fill in as many blanks as you like, make friends, join groups, add applications, play games, subscribe/follow interesting people, and like companies or organizations. Every change you make to your profile is reversible. You can easily update a profile picture, change your hobbies, unlike a page, or get rid of applications. You can even block applications and people. Many parents have joined Facebook to find out what their family is doing online and to help keep their children protected from predators. Facebook is not recommended for anyone under 13. Many parents that do allow their children to use the powerful networking tool restrict its use. Parents can set up the account for their child and keep the password secret. This way the child may only login when the parent is home. There are many options to customize your privacy settings. Facebook security has changed, so even if you aren’t new to Facebook, go to your account and security tab to check your settings. Here’s what mine look like. Secure Browsing should be enabled. You can also do this manually by making sure https is in your browser’s address bar. Login Notifications, when enabled, will email you when your account is logged in to from a computer or device that hasn’t been used before with your account. Login Approvals takes it a step further. You chose to login to new devices with an additional security code. Active Sessions will tell you wherever your account has been accessed from. Privacy Preferences allow you to adjust even more. Your default settings will depend on how you use the tool. If you use Facebook as a way to promote your business, you may wish to make business related posts public. If you are like most people, you only want to share with your friends. How Tags Work allows you to set who sees pictures or content tagged with your name. You even have the option to approve posts before they go live. On Apps and Websites you can turn off annoying applications, control how much of your profile they can see, if your profile is searchable, and if you want to see personalization on websites. That means if your friends have said something about a site on Facebook, it will show up when you visit that site. Limit the Audience for Past Posts is pretty self-explanatory. You can also change your sharing options on a post you’ve previously shared, right from your feed. Blocked People and Apps let you add friends to a Restricted List. Those on that list will only see the posts you make public. You can block users entirely so they can’t even see you’re on Facebook (possibly useful for an ex-boyfriend). You can also block events and applications here. If you block games, you won’t see your friends’ game requests in your feed. Yes, I did skip How you Connect. If you want people to be able to find you on Facebook, you’ll want everyone to be able to look you up. Same goes for if you want to receive friend requests. 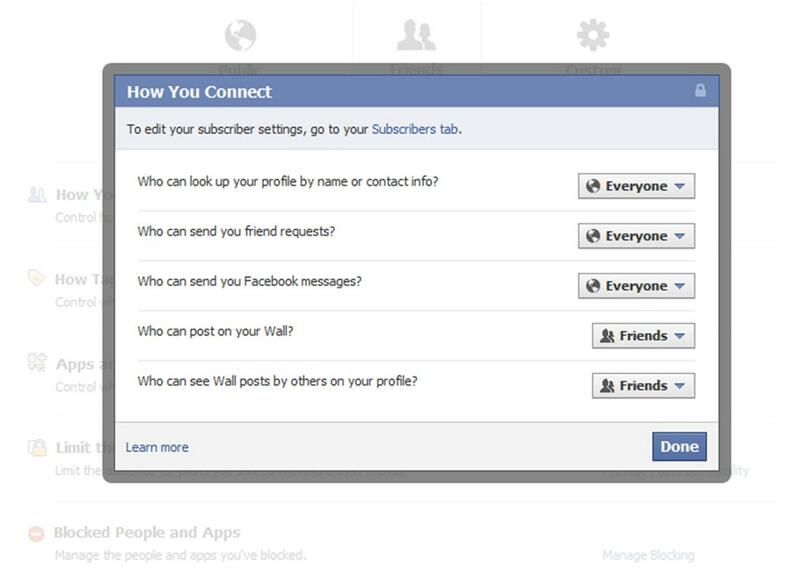 You may choose to limit who can send you Facebook messages to your friends only. Who can see and write on your wall, you probably want to keep to friends only. Remember you can also choose to adjust the privacy by post. When you update your status you have the option to choose privacy settings for that specific post. Select public, friends, or custom. You can now choose by specific lists as well. If you arrange your friends by those who live near you, family members, coworkers, and acquaintances – you can share just what’s right for them. Take the time to adjust your privacy settings. When you do, you’ll ensure a more secure and satisfying Facebook experience. How is Google Plus Faring With the General Public?